Wolverhampton's Cloven Hoof had some acclaim in the European press in its day. The band used aliases such as Earth, Wind, Air, etc. and did not mind larger-than-life customs. A MLP called Opening Ritual was released independently in 1982. By the time the full-length arrived the band had abandoned the theatrics. Their NWOBHM sound is still respected by many. The Cloven Hoof was also the name for the official newsletter of the Church of Satan. Sanctuary Records set about re-releasing the band's catalogue in 2002. The band's return album in 2005 was named Eye Of The Sun. It was initially entitled Absolute Power. Singer Russ North rejoined in late 2006. The band re-recorded twenty four of its songs for a 2008 two-part best-of compilation, The Definitive Part One and The Definitive Part Two. Guitarist Mick Powell rejoined the band in April, 2008. In October of 2008, the band had yet another new member and another line-up change. Guitarist Christian Horton was debuting at the Dutch Metal Maniacs 2008 festival. Singer Russ North left Cloven Hoof to dedicate himself to a solo career apparently. 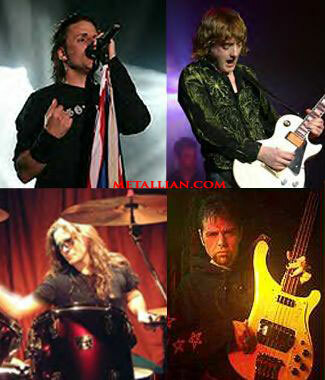 The NWOBHM band cancelled appearances at The Barbaars festival in The Netherlands and all English shows, but a new vocalist was to be recruited in time for the Hard Rock Hell festival in December of 2009. Cloven Hoof decided to release a five-song demo entitled Throne Of Damnation in 2010. It featured three new songs, Prime Time, Running Man and Freak Show along with new versions of Whore Of Babylon and Night Stalker. The disc was available at www.cloven-hoof.co.uk. Instead, there was more upheaval within the band. The band’s Throne Of Damnation EP was postponed due to the departure of singer Russ North. Matt Moreton was the new singer. Moreton was the singer on the band’s Eye Of The Sun album. The confusion and upheaval in the Cloven Hoof camp continued. Cloven Hoof was rejoined by singer Derek Hodd for its show at the Rockoff Festival on Saturday, July 17th at the Dome, Tufnell Park in London, England. Derek replaced then current Cloven Hoof vocalist Matt Moreton who was ill. Another week another line-up change or two in Cloven Hoof! The band lost guitarists Ben Read and Mick Powell as well as drummer Jon Brown in August of 2010. The band was scheduled to play at the Metal Warning Festival III in Helsinki, Finland and the Swordbrothers Festival in Andernach, Germany that summer. The line-up changes never end: Cloven Hoof had a new guitarist called Joe Whelan formerly of Dementia. The band claimed to have auditioned 147 guitar players! Cloven Hoof also recruited Mark Gould as its new drummer. Cloven Hoof announced the addition of singer Ash Cooper too. Singer Russ North was back for Christmas of 2011. Ash Cooper was out for now. Wax Maniax annoucned vinyl versions of the band’s work in 2016. February 6th 2018 saw the release of two Cloven Hoof CDs by Metal Nation Records. The Definitive Part Two was new, while part one was a re-release. The first five tracks of the new sampler were the 2010 demo The Throne Of Damnation featuring vocalist Matt Moreton.